Over the years we have revolutionized the way we show off our dogs. First we began to use colorful leashes, then the dog carrier bag became a must have. 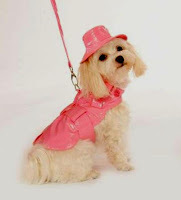 In more recent years we have been able to give our pet their ultimate individuality with their own clothing. Totally Posh offers stylish dresses, tees, tanks, and even raincoats! Come to Totally Posh and make your shopping experience not only a delight for you, but for your pooch too!